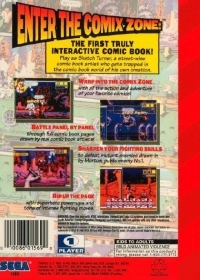 THE FIRST TRULY INTERACTIVE COMIC BOOK! Play as Sketch Turner, a street-wise comic book artist who gets trapped in the comic book world of his own creation. WARP INTO THE COMIX ZONE with all the action and adventure of your favorite comics! BATTLE PANEL BY PANEL through full comic book pages drawn by real comic book artists! SHARPEN YOUR FIGHTING SKILLS to defeat mutant enemies drawn-in by Mortus, public enemy no. 1. RIP UP THE PAGE with superhero power-ups and tons of intense fighting moves. 04-10-2017 shepard11 Box Text ENTER THE COMIX ZONE: THE FIRST TRULY INTERACTIVE COMIC BOOK! Play as Sketch Turner, a street-wise comic book artist who gets trapped in the comic book world of his own creation. WARP INTO THE COMIX ZONE with all the action and adventure of your favorite comics! BATTLE PANEL BY PANEL through full comic book pages drawn by real comic book artists! SHARPEN YOUR FIGHTING SKILLS to defeat mutant enemies drawn-in by Mortus, public enemy no. 1. RIP UP THE PAGE with superhero power-ups and tons of intense fighting moves. 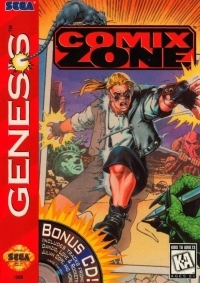 This is a list of VGCollect users who have Comix Zone in their Collection. This is a list of VGCollect users who have Comix Zone in their Sell List. This is a list of VGCollect users who have Comix Zone in their Wish List.